Audiometric Hearing Test Clinic at Backstage Access on March 5 in Edmonton. Noise is one of the most common workplace hazards. Workers in the Live Performance industry and associated occupations are often exposed to noise levels that are so high that their hearing can be damaged. Sometimes the noise might not be considered noise, it may be the loud music workers can be exposed to on stage during a sound check. With any sound that is loud enough, that workers are exposed to for a long enough, their hearing will be damaged. Damage can also happen from non-work activities such as crowds at sporting events, concerts, construction and racetracks. 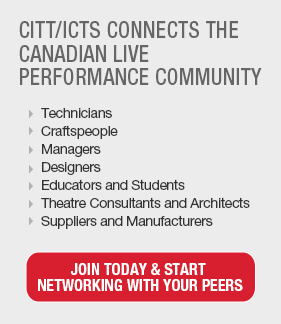 CITT Alberta along with Presenting Partner Theatre Alberta have joined together to offer free Individual Audiometric Tests to the members of both our organizations. As part of our quest to support provincial performance community, we have arranged for two-OH&S certified testers to bring their testing unit to Backstage Access. They will also have a booth in the trade show where you can learn more about custom hearing protection. These tests will provide a baseline going forward so you can know how your hearing is now and compare in future years any losses you may have developed. You will receive a printed audiogram describing what was found. Do to the length of each test (approx 10 minutes) we are only able to accommodate tests for 50 people, sign up now to reserve your spot. If you are a member you can email us for a password to register for free. Non-members we invite you to join or email us for other options. Add Free Audiometric Hearing Test Clinic for Theatre Alberta and CITT/ICTS Members to my calendar.